← $550 Million Power Ball Lottery = Happiness? The most commonly asked question I get is: How can I tell if I’m addicted to my cell-phone? You, indeed, can be addicted to your cell-phone. Cell-phone addiction is in the same family as other technology addictions (computers, gaming, etc.) which are part of a larger family of behavioral addictions. Anything that can produce pleasure in your brain has the potential of becoming addictive. The LOSS OF CONTROL is the telling sign of any addiction. How many of the following signs describe you? 1. Salience – When your cell-phone takes center stage in your life and dominates your thoughts, emotions, and behavior. 2. Euphoria – If you get excited when you get a text or call and/or feel elated after such an event this could signal trouble. turkey. If you can’t for a day or two you have issues. 6. Relapse – Have you tried to cut back and weren’t able to do so – you’re an addict. 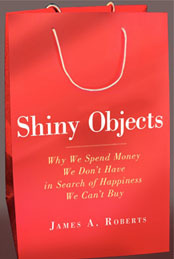 Shiny Objects makes a great Christmas present. Now, put down your phone and talk to someone. This entry was posted in Uncategorized and tagged addiction, cell-Phone addiction, conflcit, relapse, Shiny Objects, six signs of cell-phone addiction, technology, The Daily Mail, withdrawal symptoms. Bookmark the permalink. This is an interesting topic. I see many young people checking their cell-phones every minute or so. I also find myself depending on my phone too much sometimes. It can be very uncomfortable for younger people like us to not have access to the Internet for a while, and it’s annoying that it feels uncomfortable. On the other hand, it is convenient that we can “google” something that we need more information on anytime we want as long as we have a smartphone. Furthermore, smartphones and the Internet have made it extremely easy to talk to family and friends who live in a different part of the globe. For that, I am thankful that cell-phones have become so “smart” these days. I’ve noticed my parents have become more and more attached to their cell phones and tablets. When we’re eating out with family, my dad is often seen checking his email and sports scores. Even when asked to put his phone away the temptation eventually overpowers his will and he takes the phone back out. The assumption that our phones are conveniently near us encourages the idea that we should respond to messages, emails and phone calls in a more timely fashion. This assumption of timeliness can frustrate both ends of the message if it is not responded to in a timely manner. Cell-phone addiction has no age limits although it is more prevalent in teens and younger adults because of their proclivity for technology. You might enjoy a purchase I made this weekend – a cell-phone jail. You place the cell-phone of an offending user in the jail and set a timer after which he/she can spring their phone from the jail. It can be used by parents to encoiurage talking during during family meals and car trips or with friends to do the same. It’s a funny little contraption but addresses an important issue – how our cell-phones are robbing us of personal time with friends and family. 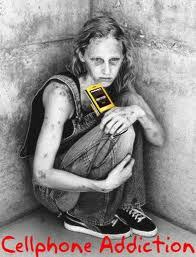 I wouldn’t call cell phones an addiction but a requirement of society. We have entered a new age world where information is at our fingertips. Our need and desire of knowledge or information is the cause of the cell phone addiction. We want to know what everyone else and tell everyone else what we are doing and having a cellphone is one way to do that. Some people seem to maybe take cell phones too far and maybe they do have an addiction. These signs of addiction are carried out through majority of the youth of America. Would you be bold enough to say we all have an addiction? I think it is a change in lifestyle more than an addiction. The power is at our fingertips to know almost any fact we could think of. Technology is such an amazing thing and our generation is using it in some good and some bad ways. We have to power to speak well of something to millions of people instantly but we also have to power to bring it down just as quick. Cell phones carry out a daily function now for most people. Older generations are catching on to the lifestyle. I will have to agree and say that although I find myself constantly using my phone and even freaking out when something happens to it, that I don’t think it is an addiction. I do think there is some attachment to cellphones but the fact is that technology is the main way we all communicate now. It’s sad to say because it definitely effects the way we are unable to communicate as well in person with someone but at the same time my one iPhone delivers my email, my messages, my school documents, and even right now I am typing this comment on my iPhone because my house wifi isn’t working!! Cellphones are able to do almost as much as a laptop or desktop and so of course our usage will go up. I will say that if my phone were taken from me I probably would freak out. But I don’t think it would be because I was t getting the latest Facebook updates or Instagram pictures. It would be because I would be completely disconnected from everything I need to know. Like right now, finding out to post on this blog. So.. Addicted to the cellphone? Maybe. Addicted to media and constantly knowing what’s going on? For sure. Keen observations Mark. Could it be that we’re all addicted? Look at how many are slaves to their morning coffee. The real essence of any addiction is loss of control. Driving while texting or talking or surfing suggests that people are willing to risk their lives and those of other to feed thier need to be online. This suggests a strong compulsion (addiction?) to use our phones. Over the weekend I bought a cell-phone jail where parents or groups of people can place their cell-phones to encourage uninterupted conversation. I encourage anyone with a funny or tragic cell-pohne story to share it here. Please forward my blog address to your friends and parents as we try to broaden our discussion of this important topic. Great comments Kayci. The key sign of withdrawal leaps forth from your response. The multifunctional nature of smart phones have really upped their potential to become addictive. As you state, you can do everything on your cell-phone. Thanks for weighing in on our discsussion. Be sure to forward my blog address to friends and family – let’s hear what everyone has to say. Cell phone addiction is something that I can see being very real. I personally do not think I am addicted to my phone.. However, I do think the world that we are living in today is one where we feel we are forced to have a media connection at all times. Not that it is necessarily a text message, phone call, facebook or twitter update but so much more that comes with our phone now. Also the academic side of media entails so many things that you have to stay up to date on. Teachers are requiring alot of media connection through Email and Blackboard that they might not realize or like. Subconciously we are all growing more media minded because all of the generations have either grown up with technology or the older generations are trying to learn to use it. So it’s a condition similar to keeping up with the Jones’ but now everyone is just keeping up with the phones’.. and in doing so everyone gradually becomes more an more dependant on our phone because most of us feel like we “have to” in order to keep up. After reading the signs of cell phone addiction, I can say that I am not addicted. However, my phone does play an important part in my life. Being a journalism major, it is important that I keep up with current events and social media. With my phone, I easily have access to all the major news sites and social networks when I am on the go. Since technology now is essential for people staying connected to the outside world, I understand how people can become addicted to cell phones and computers. When a person’s phone goes off alerting them that they have an incoming call, text message or e-mail, it is understandable that they get excited because it could be an important message that needs to be responded to right away. With me, I know that I use my cell phone a lot but I do know how to control my usage and when it is inappropriate to use so that I can put it away for a while. Family time is extremely important to me, so when I go out to eat with them, we will all put our cell phones in our purses or pockets so that we can enjoy each others’ company without interruptions. As mentioned in another comment, my parents, too, are starting to use their cell phones more. For my parents, they use their phones to easily communicate with me while I am away from home and to communicate with other family members. I agree that as Americans, we tend to overuse or depend on our cellular devices. However, I don’t necessarily know if that makes us addicted, especially when it comes to a phone being broken. I know that my phone is the only way I can stay in contact with someone when I am traveling or away from a computer. Living so far from home, I depend on my cell phone to keep in touch with my parents and friends so I feel like anxiety when I cannot do those things is normal. That being said, if a person cannot go an hour without their phone, I agree that addiction is probably happening. Likewise, that seems a common problem with many students who are incapable of going without a cellular device in class. Amen to your cell-phones in class comment 🙂 Do you think that using your cell-phone in class suggests you might be addicted? It appears to suggest salience, euphoria (too excited to ignore the phone), tolerance, withdrawal, conflict (if caught), and relapse if you’re a repeat offender. The same holds true for texting and driving. Clearly something to think about. Reading through some of the symptoms of cell phone addiction, I can say that I am not exactly “addicted”, but I have definitely noticed recently that I am on my cell phone way more than I really should be. Whenever I have down time or even a few minutes where I am not doing anything, I get my phone out and start looking up stuff or playing a game, and not doing anything productive. I do get kind of excited when I get emails or messages, but I think that is a natural human response, it satisfies the feeling of being wanted or needed. Also, I have noticed with my family being on their phones a lot as well. My brothers are constantly texting or watching videos, and my mother is always Facebooking, and it is mostly while we are watching TV. I think it is becoming normal to look at two different screens at the same time. Like watching TV and playing on your cell phone at the same time. I actually am trying to cut back on my cell phone use right now because I think for me it is becoming problem and it is not something I really want to get used to. Thanks for sharing your thoughts. Your description of your cell-phone use seems to bring to mind most of the six signs of behavioral addiction. Good luck on cutting back. Like everything in life, it’s all about finding balance. Be sure to share this post with your mom and brothers – I would lke to hear their thoughts. I definitely think that cell-phone addiction is prominent. I have had experiences where I couldn’t find it, and went into a panic until I did. I couldn’t think about anything else. However, on some days when I leave it at home I panic, but then it’s almost a relief to not have to check it and get a break. I think it’s a very interesting topic! It would be interesting to see all the studies done on this topic. I believe the constant use of cell phones is a lifestyle change, which easily leads to a type of addiction. As time progresses the age when children and teenagers are getting cell phones is only getting younger and therefore they will become even more attached. I use my phone for a lot of necessary things with its capabilities but I do sometimes catch myself checking it for no reason. The stress that is caused when people lose their cell phones for short amount of times is embarrassing that we are so dependent on their simple presence. It is sad to think of everything that is happening right around us because we are looking down at our cell phone more than simply being present in our current situations. Cell phones are convenient and extremely useful, but I believe there is a small percentage of people, especially youth, who don’t spend unnecessary additional amount on their phones. I definitely agree that you can be addicted to your cell phone. I have a roommate that loses all focus whenever she reaches for her phone; we can be in the middle of a conversation but if her phone goes off she stops listening and directs all of her attention to her phone. As cell phones have become more popular I think they have become a bigger problem. Because it is a social norm to have a phone some people use that as an excuse to devote extra time to their phone. They are so convenient and useful but they are absolutely creating issues in social life and relationships. While I do think that Americans over use our cell phones, I think most of us are not addicted. My cell phone is nearly glued to my hand, but that is due to the fact that my phone keeps me updated with emails and reminders of what I need to do during the day. The maps keep me from getting lost. I can contact friends if I need a ride, or have to cancel lunch plans. The capabilities are endless, so that is why we use them so often. But that does not mean that we are addicted. Cell phones just make life easier. My generation has grown up always having cell phones. The hysterical state that ensues with the loss of a cell phone is probably more pronounced because something familiar and almost appendage-like has been lost. We use cell phones for everything – phone calls, internet, directions, school, & work life. Some may say it’s not an “addiction” for them… but in this day and age many would say it’s at least a necessity for the digital world in which we live. I agree with the comments above that say cellphones are a necessary way of life in todays world. We use our cellphones to interact with eachother, families that are geographically apart, business deals, homework help and many more reasons. I know I personally use my cellphone for everything–calendar reminders, alarm clock, communication between friends and family, and even mobile banking. I do not believe that one is addicted to his or her cellphone because they check it all the time or that they freak out if it has gone missing. In our world, we fully depend upon cellphones to help organize and manage our lives. I know I am not addicted to my cellphone, but am very accustomed to depending on my cellphone for everything I need. I went on a cruise this summer and had to turn my phone off for a week. It was a little strange at first, but not having my cellphone go off with emails, reminders or texts was actually a nice break. I believe many cellphone users would find this to be true for themselves also if they were forced to turn their cellphones off. You are living proof that turning off your cell-phone won’t kill you. It even sounds like you enjoyed untethering from the digital world. I recommend a social media fast for anyone brave enough to try it. Let me know if anyone decides to give it a shot – I would like you to maintain a journal if you do. I seem to be hearing that cell-phones are somehting we simply can’t live without. Up until 20 years ago or so we seemed to be doing just fine without them but I acknowledge that they serve their purpose. Does this dependence (addiction?) to our cell-phones come at a cost? In other words, what are the costs of our preoccupation with cell-phones? I will start out. It seems that a 27 year old British woman was so engrossed with texting her boyfriend that she walked right into an icy canal and had to be fished out by a well-placed bystander. This is similar to the viral video of a woman in the US walking into the fountain at a shopping mall (caught on a security camera). These incidents are funny but what about texting and driving? So, what are the negatives of our love of cell-phones? Feel free to share. I’ve had such a busy life the past 3 years, that I can’t imagine getting anything done without my cell phone. I live with my parents and I use their car to get to school and work (since I don’t have my own), and very often have to be “on-call” to pick up my mom from her job, or take her there. I also own a photography company, and during busy seasons, I have to be reachable to our customers. To justify my behaviors I always think that my life doesn’t stop just because I’m in class or at work. Especially now, planning a wedding requires meetings and meetings and shopping and all that has to be coordinated during school so it can be put into action immediately after my last class. I understand that some of my behavior is considered sign(s) of addiction. And I’m concerned. I want to be able to just completely forget about my cell phone for a while. I sit in the very first row in all my classes so that I’m less tempted to get my phone and check it, since I feel it rude to do so in front of the teacher. Sometimes I can’t help myself, and I’ll start checking it constantly, and sometimes even feel it vibrates in my pocket, when it truly hasn’t. I do not believe we are addicted to cell phones. Phones are simply a vessel to access the things we are really addicted to. We are a society addicted to attention; we constantly check to see how many likes or comments we have on Facebook, we check to see if anyone has cared enough to text or call, we check the latest gossip or score to impress or interest our friends, we take pictures and instagram them to prove to the world that our lives are interesting and to call out for attention. I don’t think cell phones are the core problem, but rather the poison of entitlement, self-importance, and the need for attention. I think you hit the nail on the head with this one. And, very well said. I look forward to hearing your thoughts in the days ahead. I believe 100% that cell phone addiction is a real thing. But I also believe the convenience that our cell phones offer has made this addiction become more powerful. For instance 8 years ago a cell phone was just to call and text. Now we can read articles, browse the internet, play games, and visit many social media apps. The addiction has been much easier to achieve, because now we can access every part of our technological life through something that is tiny enough to fit in our pocket. I personally see this addiction growing more and more as time goes on. I agree with the other comments that using our cell phone is a way to communicate and get around in life. I know I use my phone alot to stay connected to Facebook, instagram and twitter and I am in constant need to check my phone for messages. I know that that I am slightly addicted to my phone but I have also gotten an emergency call where I needed my phone when a family member desparately needed to contact me. After receiving a call like that, it scares you and makes you constantly need to feel your phone on you just in case another call comes. So, I would say that I’m not addicted to constantly needing to “use” my phone but I guess I would admit that I am addicted to always having to be holding it. As technology has progressed, cell phones have become a convenience factor for receiving any desired information, as opposed to just a device that you could call someone one without being restricted by a cord. In order to meet and exceed consumer expectations, companies have in essence gone to battle trying to out do each other with what gadget they can put in their phone to one up their competitors. At first it was voicemail and text messages but has grown into taking pictures with cameras that are better then traditional cameras, an app for about anything imaginable, receiving emails without a computer, having an alarm or reminder all in the same place, etc. Rather than being addicted to the phone, we are addicted to the ease and convenience of learning information from simply touching a screen and having it appear instantly. I can go a class period without looking at my phone, but when I don’t know where it is I do panic. I think it’s more of a reaction to the thought of “everything” is missing. My phone keeps track of not only my calendar, reminders, alarms, etc., but I also have the Wall Street and follow stocks on it, in addition to Facebook, Twitter, Instagram, etc. Society and technology have created an atmosphere and generation where we can practically run our lives from a device that is smaller than the size of a notecard, and that’s where I think the addiction is. Reading through these previous comments I agree with a lot of what everyone has said from both sides. On the one hand cell phones are a necessity in todays day and age and one could even go as far as to say the smartphone itself is a necessity for us college students and working types if only to respond to emails faster (something that we used to be patient enough to wait a couple days to hear from someone). But I also think that there isn’t as much an addiction to the physical phone as the person on the other end. Personally I only talk to one person daily on my phone and my second text in my “recents” is three days old. There is definitely a much higher need to feel accepted amongst our generation than those in the past and I think that a lot of that comes from how interconnected we all have become. People are just more accountable for everything they do and thus are more likely to keep checking to make sure that they are saying/wearing/doing coincides with what image they are trying to portray. Occasionally I find myself constantly checking my phone whenever it rings, but I do not feel as if I am addicted to it. Today, technology is extremely important in our lives. We use it to keep in contact with family and friends via social media networks, keep updated on news, check the weather, etc. Peraonally, I feel like people are addicted to their cell-phones is because what’s on their phones, whether it’s Facebook, Instagram, Snapchat, texting, email, or even mobile games. Even though that cell phones make it easy for us to live our daily lives, but we should keep in mind that it can turns into an extremely kind of addictions! YES! you read that one right ADDICTION! Cell phones addiction is one of the most dangerous addictions you may ever heard about! because you don’t know if you have it unless if you tried to stop using these electronics for a specific period of time, and if that period didn’t pass very well, you are surly addicted to your smartphone! and this addiction has its own impacts on our lives! it will ruin your REAL social life!